One thing I really love about blogging is discovering new and exciting interior products - I always get a buzz from imagining how these might look in my own home as well as in other schemes and settings. 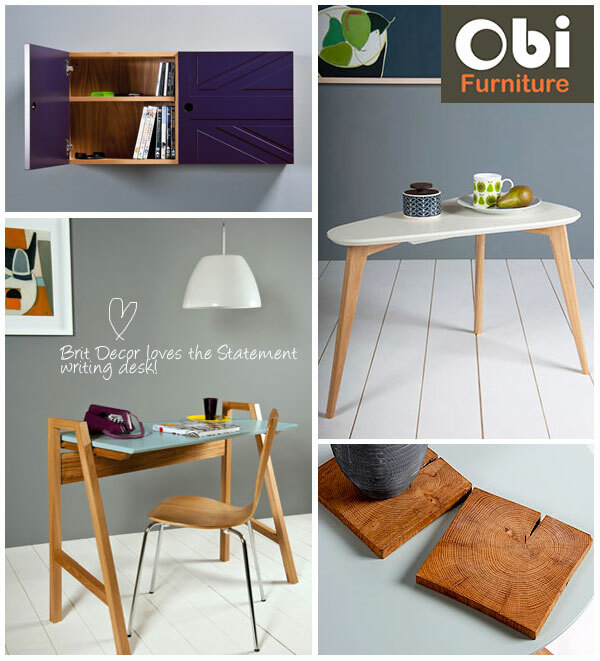 So imagine my excitement when I discovered that these beautiful designs from Obi furniture are made in the Somerset countryside (my home county!). It's not always easy sourcing handmade bespoke designs in the latest contemporary styles but Obi have pulled this off with stunning results. Made from Walnut and Oak, the range of furniture is very 'on-trend' with sleek contemporary pieces, which have elements of mid-twentieth century styling. To add to my excitement about many of these products, you also get to choose from a variety of neutral and vibrant colours! If you want to keep up to date with the latest news at Obi, you can follow their blog here. Clockwise from top left: 'Jack' cabinet £380, 'Pear' side table £210, Oak coasters £15, 'Statement' writing desk £750.